If you are looking to buy a custom made leather watchband, you should look at Greg Stevens Design. The various leathers and styles are impressive, as is the attention to quality, detail, and customer service. Whether a Rolex, Panerai or just your favorite Timex, Greg Stevens Design watch straps can really make a statement and compliment a timepiece. I was looking for a strap to give a Fossil watch that I received as a gift a boost of personality and confidence. With Greg’s recommendation, I chose a strap made with vintage looking leather and stitching complimenting the face and antique design of the watch. This strap is constructed with 3.75 mm thick Horween Leather’s Dublin Coffee Brown with light bronze polyester thread stitching. The edges of the leather are finished in a glossy and smooth black edge coating. The hardware is a brushed stainless steel buckle (PVD, brass, and polished steel are also options). Having a standard size wrist (7 ½ inches or so), I left it to Greg to size the strap how he saw fit. The longest end measures about 5 inches and the shorter side measures about 4 inches (including the buckle) for a total length of about 11 inches with the 44mm diameter watch. The strap comes with one free-floating band holder that is constructed from a strip of the same leather and thickness. My first impression of the strap upon taking it out of the box was that it was a thick and stiff band. One might think the thickness might be too much and would be stiff and uncomfortable but, like most leathers, it started to bend, stretch and soften after the first few wears. One will definitely appreciate the thickness and heft of the strap. There are 5 buckle holes and after the strap stretched a bit after the first few wears, I am now at the third hole. This is a nice fit for me without my wrist feeling constricted but also not having my watch dangle down around my forearm. When looking for a strap for my watch, Greg recommended a vintage looking leather (Horween Dublin Coffee Brown) and stitching (light bronze), a perfect compliment to the face and antique design of the watch. This particular leather has a slight ‘pull up’ (when bent, changes to a lighter color) and gives way to a cracking effect that gives the leather an old-world vintage look and feel. As the buckle hole end stretched, the leather around the holes lightened and wore in faster than the rest of the strap. The wear from this type of leather attributes to its aged and antique appeal. The large band fastener on the strap at first seemed too bulky, stiff and a tad flimsy feeling as it just floated on the unbuckled strap. Like the rest of the strap, it started to bend and wear a bit and soften up. When buckled, the fastener stays firmly in place and is very comfortable. 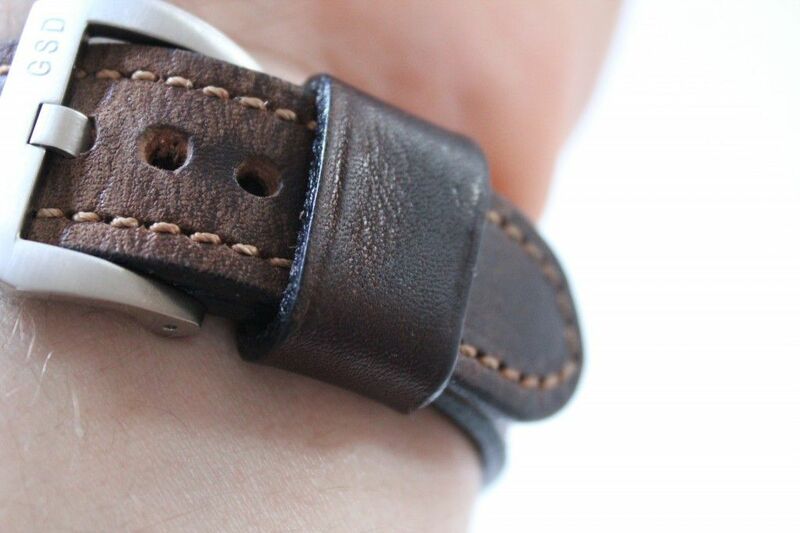 For $175, this is well worth the price to pay for a custom-built leather strap. 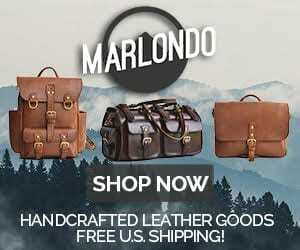 Greg has about 3 dozen different, high-quality leathers from Horween leather as well as some vintage French, Swedish, and Swiss leathers to choose from and many different thread colors as well. You can choose a buckle finish, thickness and length of the band, stitch pattern and even add some custom rivets (additional charges). Of course, if you’re not completely sure about sizing, leave it to Greg. After giving him the size and make of the watch, he sized the strap how he saw best complemented the watch. It’s like having your own personal watch tailor! This is a very comfortable watch strap. Although a bit stiff at times, I suspect it will continue to wear and soften quite nicely. 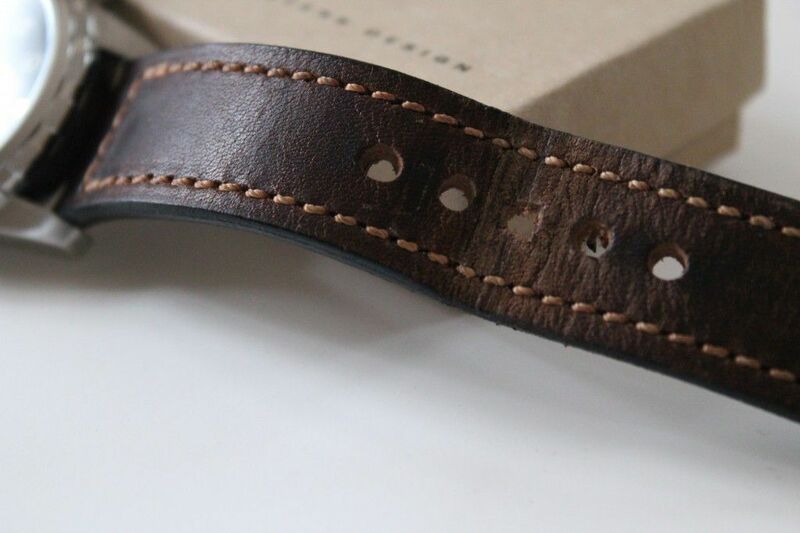 Judging from the quality of the leather and craftsmanship, this strap is built to last. There was only slight worry about the stress marks on the hole end so I asked Greg about care for the product. Greg recommends using a little leather conditioner over time if the leather appears too dry. Lastly, the customer service Greg gave me through the process was very sincere and friendly. Having been my first time having a custom leather strap built for me, I needed a little guidance through the process. Greg answered all questions and requests I had and left me feeling fully satisfied on how I wanted my strap to look. It exceeded my expectations when I first opened the box. Even though the picture gallery and customer testimonies on Greg’s site are featuring higher-end luxury watches, I am convinced that even my Fossil fits the bill for Greg’s beautiful watch straps. 4 Comments on "Greg Stevens Design Custom Watch Strap Review – $175"